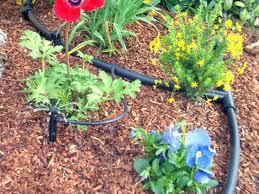 Drip Irrigation = Big Water Savings! You are here: HomeUncategorizedDrip Irrigation = Big Water Savings! Irrigating systems have been used since the dawn of civilization. The Mesopotamians, Egyptians, and Aztecs developed their own complex methods for delivering water to their vital crops and edible plants. Fortunately, modern irrigation systems don’t require a massive waterwheel and team of oxen to operate. Today’s modern drip irrigation systems are more efficient than ever before. Over the past century, the agriculture industry has perfected irrigation systems through many high-tech innovations like soil moisture sensors, micro sprayers, and fertilizer injectors. Some of the first drip irrigation systems were used by the Ancient Romans. In arid regions, the Ancient Romans buried water-filled, earthen vessels in their fields to slowly transfer water to the roots of growing crops. Today’s drip irrigation systems transport water and fertilizer directly to the roots of trees, shrubs, and other landscape plants though a series of underground pipes and drip emitters. According to the Alliance for Water Efficiency, the efficiency of drip irrigation systems is near 100% making drip irrigation the most effective and environmentally-friendly method of landscape irrigation. With aboveground irrigation, the average efficiency is between 50% and 70%. Traditional rotating sprinklers and pop-up irrigation systems lose approximately 30% of their total output through evaporation and off-target overspray. Studies on water consumption show drip systems can reduce water use by 50 gallons per plant each month, which results in tremendous water savings of the course of a season. For homeowners, this means lower water bills and a trouble-free landscape that always looks its best. Drip irrigation systems also reduce the prevalence of weeds, insect damage, and foliar diseases. Overhead irrigation soaks plant foliage creating the ideal environment for mildew and fungal diseases. Insects are also attracted to the tiny puddles of excess water left behind by overhead irrigation; drip irrigation eliminates many insect problems by making the aboveground environment dry and inhospitable. By delivering water directly to the root zone of target plants, drip irrigation dramatically reduces the number of weeds that sprout between plants. Although supplemental water is one of the essential elements for a lush, green lawn, excess surface moisture creates an environment prone to beetles, grubs, webworms, and other lawn pests. Drip irrigation keeps the lawn and landscape healthy by delivering the right amount of water to each part of the landscape. Irrigation professionals will work with you to design and build a concealed drip irrigation system that only delivers water where and when necessary. Individual soil moisture sensors automatically shut off drip emitters after rainfall or when soil is sufficiently moist. In addition to adjustable moisture sensors, emitters are installed as needed around the lawn and major landscape plantings. Automatic drip irrigation systems with integrated timers and moisture sensors insure your plants always receive the correct amount of water for worry-free landscape maintenance all year. With professionally installed drip irrigation systems, you are guaranteed a high-quality irrigation system from the emitters and vales to the pump and filter. After installation, Green Acres clients receive full support for seasonal maintenance, repairs, and replacement parts. Investing in professional installation is investing in the future of your irrigation system and your landscape plants. A well-designed and maintained irrigation system will provide you with years of trouble-free service and a lush landscape all year long. Copyright © 2017 Green Acres Nursery & Landscapers - Vista. All rights reserved.